Apple may open next week's WWDC 2013 by introducing new MacBook Pro Retina and MacBook Air computers, with some leaks out today pointing to the machines as distinct possibilities. Newly uncovered SKUs, believed to be for Apple's notebooks, were sent to 9to5Mac: the cryptic MD711LL/A - Better, MD712LL/A - Best, MD760LL/A - Better, and MD761LL/A - Best. In all likelihood, these model numbers belong to either a refreshed MacBook Pro Retina or MacBook Air, as Apple is known for always offering two screen sizes with two different configurations. The difference between the specs typically amount to processor speeds, RAM and storage capacity, if Apple's MacBook configuration history holds true. Even though it looks as if the four model numbers conform to one MacBook line, WWDC could still debut both a refreshed Pro Retina and Air. The 2013 MacBook Pro Retina is rumored to be receiving a slimmer profile in addition to having its processor bumped up to the Intel Haswell chip next week. 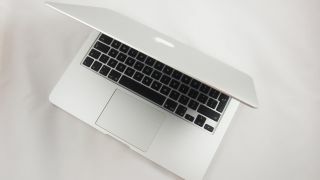 Likewise, the 2013 MacBook Air would benefit from the battery-saving Haswell processor and previous reports have indicated the Air line is due for dual-microphones. The MacBook Air refresh was also thought to be the next in line to receive a Retina display, but the added cost for Apple's lowest-priced laptop would make that a challenge, at least at this year's WWDC. Apple's Mac Pro redesign may also be talked about at next week's conference, as the company has promised to redesign its desktop computer before the end of 2013. A passionate fan of the Mac Pro line created the "We Want a New Macpro" Facebook page - now 20,570 likes strong - and says he received tips from multiple sources recently. The 2013 Mac Pro is said to be heavily reliant on Apple's Thunderbolt interface with the radical move of doing away with FireWire 800 ports and optical drives. Another bold move is the Mac Pro's supposed lack of internal expandability. This would mean that Apple's desktop would be falling in line with the rest of its one-size-fits-all computers. The redesigned Mac Pro is said to be a fall release, meaning there's a good chance that computer-focused WWDC is the best time for its unveiling. With Apple also thought to be previewing Mac OS X 10.9 at WWDC, this means that the event's only post-PC announcement will be the confirmed Jony Ive iOS 7 debut ahead of the expected September launch of iPhone 5S. Did you know E3 2013 kicks off the same day at WWDC? Which TechRadar coverage will you follow more? Decisions, decisions.